There are numerous ways in which thought processes go astray, leading us to false conclusions, even persistent delusions. 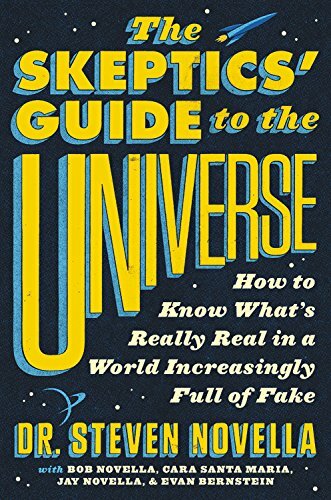 Skepticism, as an intellectual endeavor, is the study of these mental pitfalls, for a thorough understanding of them is the best way to avoid them. Science itself is a set of methods for avoiding or minimizing errors in observation, memory, and analysis. Our instincts cannot be trusted, so we need to keep them in check with objective outcome measures, systematic observation, and rigid control of variables. In fact bias has a way of creeping into any observation and exerting powerful if subtle effects, leading to the need to completely blind scientific experiments. Good scientists have learned not to trust even themselves. One of the most common and insidious bits of cognitive self-deception is the process of anomaly hunting. A true anomaly is something that cannot be explained by our current model of nature – it doesn’t fit into existing theories. Anomalies are therefore very useful to scientific inquiry because they point to new knowledge, the potential to deepen or extend existing theories. For example, the orbit of Mercury could not be explained by Newtownian mechanics – it was a true anomaly. It and other anomalies hinted at the fact that Newton’s laws of motion were incomplete in a fundamental way. This recognition eventually led to Einstein’s revolution of relativity theory. Pseudoscientists – those pretending to do science (maybe even sincerely believing they are doing science) but who get the process profoundly wrong, use anomalies in a different way. They often engage it what we call anomaly hunting – looking for apparent anomalies. They are not, however, looking for clues to a deeper understanding of reality. They are often hunting for anomalies in service to the overarching pseudoscientific process of reverse engineering scientific conclusions. What this means is that pseudoscience almost always works backwards – that is its primary malfunction, starting with a desired conclusion and then looking for evidence and twisting logic to support that conclusion. With regard to anomalies the logic often works like this: “If my pet theory is true then when I look at the data I will find anomalies.” The unstated major premise of this logic is that if their pet theory were not true then they would not find anomalies. This is naive, however. Another component of this line of argument is the broad definition of anomaly. In real science an anomaly is only declared so after exhaustive efforts to explain it within existing theories fail. Astronomers checked and quadruple checked their calculations of Mercury’s orbit. They hypothesized that there were other bodies in the solar system exerting gravitational effects on Mercury. They did everything they could to explain Mercury’s orbit within Newtonian physics. This process didn’t really end until Einstein explained the orbit of Mercury. What pseudoscientists do is look for “apparent” anomalies – things that cannot be immediately explained, or (even worse) are just quirky coincidences. Often they also look at the edges of detectability where data becomes fuzzy and anomalies are easier to imagine. Think of the fuzzy pictures of Bigfoot or UFOs, with believers looking at details smaller than the resolution of the images and declaring the presence of anomalies. They imagine that if they can find (broadly defined) anomalies in that data that would point to another phenomenon at work. They then commit a pair of logical fallacies. First, the confuse unexplained with unexplainable. This leads them to prematurely declare something a true anomaly, without first exhaustively trying to explain it with conventional means. Second they use the argument from ignorance, saying that because we cannot explain an anomaly that means their specific pet theory must be true. I don’t know what that fuzzy obect in the sky is – therefore it is an alien spacecraft. What pseudoscientists often fail to recognize is that if you take any complex natural phenomenon, historical event, object or process and you look for apparent anomalies (broadly defined), you will find them. Humans are great at pattern recognition, and so if you look for coincidence in the data you will detect them. You will also find features that resulted from a complex interplay if unique events and therefore will be impossible to prove a specific explanation. The JFK conspiracy theorists are masters of anomaly hunting. The events of that day were confused and panicked, on all sides. It would be amazing if you couldn’t find many unusual features. But the absolute king of anomaly hunting must be Richard Hoagland. He can turn anything into a conspiracy – and not just any conspiracy, but his specific bizarre belief system in alien civilizations, NASA cover ups, and tetrahedrons. I was recently pointed to this essay by Hoagland on the Saturnian moon Iapetus. Iapetus is genuinely a cool world, with very unusual geology. We are still in the process of exploring this moon, generating hypotheses as to what processes could have created its unique features, and then testing those hypotheses. But at this point in our exploration of the solar system and the universe it should be expected that most new things we discover will be new an interesting, not familiar and explained. There is no reason to think that earth geology should explain the features on other planets and moons that are experiencing and resulted from very different forces and processes than those at work on earth. We also have a very limited data set, with close robotic exploration of a few planets and a few dozen moons. We should expect that we are very far from anything approaching a thorough science of exogeology. For Hoagland this means that NASA images of other bodies in our solar system is a rich source for anomaly hunting – a hobby he engages in with utter enthusiasm. His essay is just chock full of anomaly hunting -he even uses the term often. Most of his anomalies are not really anomalies, they are not terribly interesting coincidence, or just his favorite tactic of using low-res images and an active imagination. Note (close-up, below) the string of bright, reflecting objects — hanging (somehow …) well above the satellite’s limb …. There are two explanations for these “floating” objects that would need to be excluded before concluding that they are anomalies requiring the introduction of a new element to explain. The first is that it is just pixelization artifact. Again – this is at the limits of resolution, where Hoagland thrives. But perhaps a more likely explanation is that this is just the peaks of mountains catching the sunlight, while the base is in shadow. Isn’t that exactly what we would expect at the rim of the lighted side of a moon? That is about the level of Hoaglands anomalies. But the central anomaly of this website is the “wall” of Iapetus. 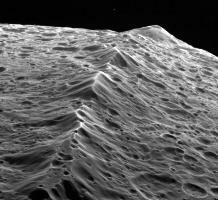 Iapetus is shaped somewhat like a walnut, with a ridge that goes around its equator. Something funky definitely happened to Iapetus to create this ridge, and astronomers are having fun trying to figure out exactly what that was. Hoagland, however, leaps (with some fancy pirouettes, a double twist and a flourish) to the conclusion that the ridge is a manufactured wall. He then uses his “low res” trick to imagine “anomalies” in the ridge, then uses the logical fallacy one-two punch (confusing unexplained with unexplainable and the argument from ignorance) to conclude that aliens not only constructed a wall around Iapetus, they constructed Iapetus. But Hoagland’s enemy, his arch-nemesis, is the ever increasing resolution with which NASA images the solar system. This was his undoing with the infamous “face on Mars” photo that Hoagland championed. Later higher resolution images showed the face on Mars to be a natural formation. Hoagland recovered, however, by claiming (you guessed it) a NASA conspiracy. His essay is largely built on the low-res pictures from the Voyager probes with some images from Cassini. He has not yet updated the site with the higher resolution pictures of Iapetus from Cassini. With these higher resolution images Hoagland’s wall look suspiciously like a natural mountain range – albeit one unfamiliar to earth-bound observers. Of course these images are coming from NASA so Hoagland should have no difficulty dismissing them. Pseudoscientists, like Hoagland, abuse the concept of anomalies in many ways. They look for apparent anomalies, then prematurely conclude they are true anomalies, and use them to confirm a conclusion they already had in mind. They fail to recognize that finding apparent anomalies or coincidences is not predictive that a new phenomenon is actually at work. Life is full of apparent anomalies and coincidence, and we evolved the pattern-recognition software to find them and be compelled by them. That is the ultimate cognitive pitfall of anomaly hunting, and why we need science and skepticism to ward against such pitfalls.